Nice right? After reading through the cookbook I decided that my obsession over the Pear Cake on the cover was so great that it had to be the first thing I made. 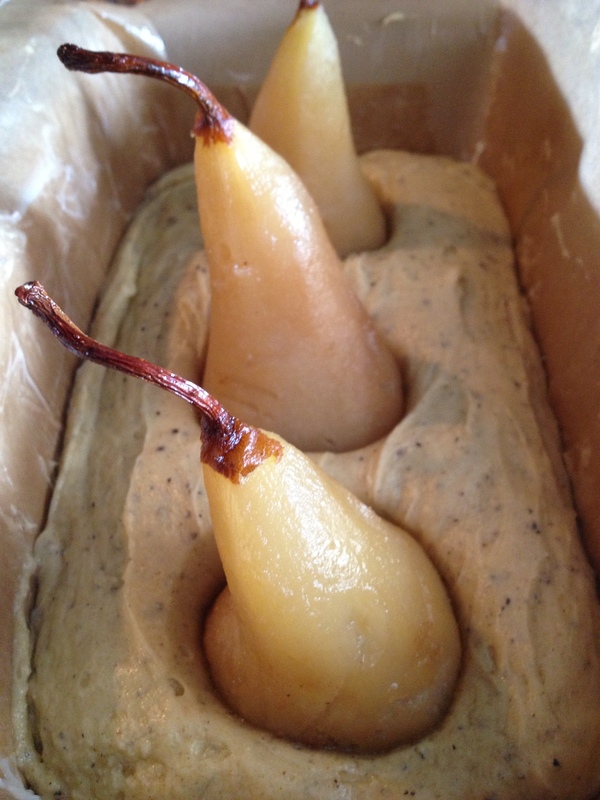 The full title to the recipe is: Cardamom Cake with Whole Pears & White Chocolate. Ms. Boven admits that the cake and recipe have been published everywhere, which makes me think it must be a home bakers dream cake, cardamom and pears two of my favorite things and the white chocolate in this instance seems a brilliant use for my least favorite kind of chocolate. The first thing I noticed when I opened the page, to really look at the recipe, was the first ingredient in the: “For the Cake” section: 1 1/2 cups plus 2 Tablespoons of butter (200g) well that’s,each stick of butter in the USA states that it weighs 113g equal to 1/2 cup…..so if each stick is 1/2 cup then that means the 1 1/2 cups the recipe is calling for is: 3 sticks plus 2 tablespoons (22 Tablespoons) – 6 tablespoons short of a pound of butter! 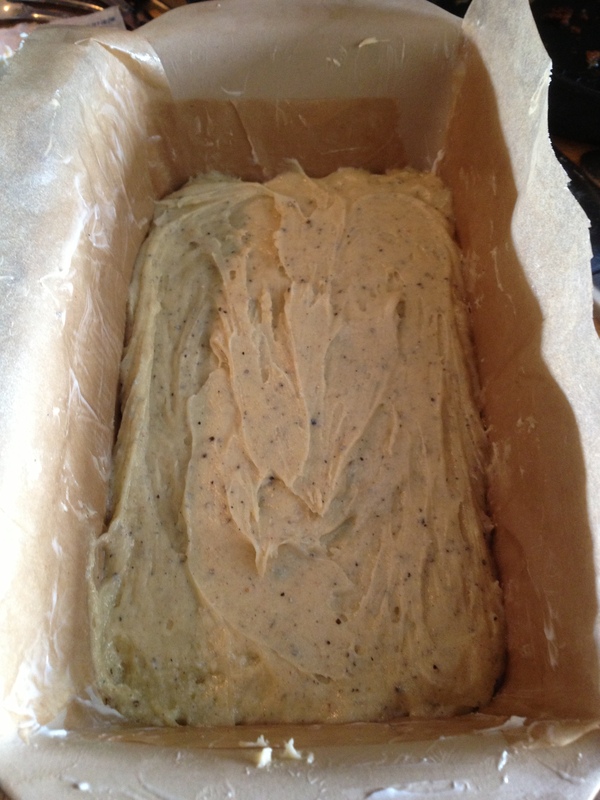 That, my dear readers, is a lot of butter for a loaf cake, maybe I’m wrong, maybe I’m reading something incorrectly. I scratched my head and did some research on the interwebs. Ms. Boven is European and spends her time between Paris and Amsterdam (lucky her ;-)) all the information I found on-line showed the recipe in European publicans. In my looking I found nothing in the North American press so all the recipes I saw called for 200g of butter – none of them gave a cup equivalent. Then I just did what I should have done to begin with (I love a good diversion) I asked Mr. Google: How man cups of butter is 200g? The answer: 7/8th of a cup. Not 1 1/2 cups plus 2 tablespoons but 7/8th of a cup. Which as it turns out is 1 1/2 sticks of butter plus 2 Tablespoons – so 14 Tablespoons of butter (that would be 8 tablespoons less than the recipe calls for). This seemed like a very careless error to make in a cookbook publication by a women whose last book Homemade was a run away success and that was published by a major publishing house: Stewart, Tabori & Chang. …and it gets worse. The recipe calls for 3 medium crisp pears (such as Bosc) OK so call me madcap, but I had 3 Comice pears in the fridge and thought given they were on hand I would use them. BAD IDEA. When baked into this recipe they became Pear Sauce. The center of the cake fell in and was gooey I had to throw it out. Any casual reading of the ingredient “Pears” would be a mistake. I think Bartlett pears would react the same way the Comice did so really what this recipe means is: 3 crisp Bosc Pears. Full stop period. Also it doesn’t say if you are to use salted or unsalted butter…which brings me to my last point about this recipe, like a fair amount of European baking recipes I have come across lately it calls for self rising flour (1 cup of flour, 1/2 teaspoon of salt and 1 1/2 teaspoon of baking powder). I’ve been baking for 30 years and have never used self rising flour. It seems to me to be a made up ingredient to get you to buy something you don’t need that is made from things any baker in North America already has (flour,salt and baking powder). More to my point is that in order to make your own self rising flour (see recipe above) you are already adding 3/4 teaspoons of salt to this cake, which seems plenty to add to a cake, but then in addition she says pinch of salt. Obviously if you are using salted butter don’t do this. I don’t think it needs any more salt then is already in the flour. Up to you. All I’m saying is that most cakes call for about 1/2 teaspoon of salt, this struck me as a lot even thought the final product was not “salty” in the least. Don’t you think when you are publishing a popular cookbook for the American market and you are featuring a baked good on your cover which has already received mega press that you would bother to run this recipe by a responsible test kitchen? OK maybe this is a one off mistake, I’ve made several recipes from this beautiful cookbook and had no problems, but now I am leery of each recipe and make sure that the U.S measurements measure up to the European ones for fear I make something and it ends up swimming is butter (mind you I can think of worse things, but still you get my point). 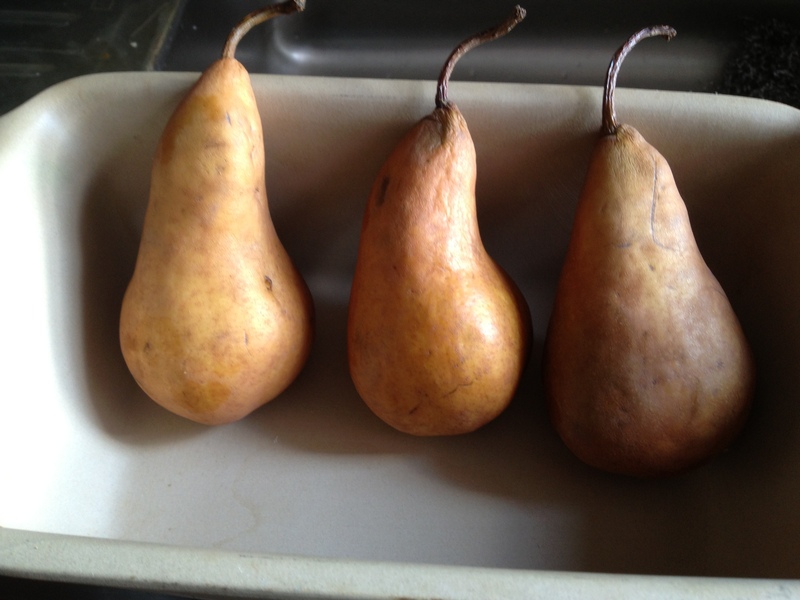 It Bosc Pears can be really big. The three in the pictures were the smallest ones I could find and they still seemed much bigger then the ones used in the cover picture. It’s America after all so everything is bigger here 😉 so be sure you get ones that are really small and will work in a loaf pan that has sides that are only 5″ high. At the end of the day this is what I think about this recipe: it’s pretty, but you need to deal with Pear seeds and stems and a dry cake that needs to be doused in syrup and because you use whole Pears every slice gets a different amount of Pear some not so much some lots. The Syrup is a great equalizer and moistens the cake wondering also adding a seductive spiciness, but it seems to me like it should be an option not a necessity. Really what I think this cake needs is less aesthetic and more baking sense. I think the Pears should be seeded, stemmed and cut into large chunks and folded into the cake before it is put into the oven (and I think 4 pears would be better than 3 if you were to make it this way). My third go at this cake will be the version I just laid out – more on that after I have made it! In the mean time: Hey folks at Stewart,Tabori & Chang I hear you need a good recipe tester….give me a call I’d love to help you out. This entry was posted in Other Stuff, Recipes and tagged Cake, cardamon cake with whole pears and white chocolate, Homemade Winter, Pear, Pear Cake, Stewart Tabori and Chang, Yvette Van Hoven. Bookmark the permalink. I love that you include so much in your posts about trial and error. I do the same thing with my students when they come in for instruction. I purposely show them examples that don’t work because that’s the reality of research. Same with baking/cooking. This post was so no-nonsense. Loved it! Thanks Philip! I think if nothing else people should be aware of what they are getting into when they start a recipe – especially one like this which is filled with vagueness and error! Great post–thanks for the advice. 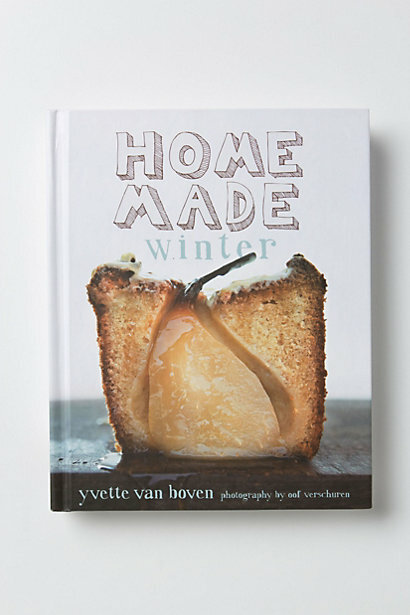 I checked this cookbook out at the library and am itching to try that oh-so-beautiful cake on the cover. Yes, the photograph is beautiful and, aside from already lusting after her first book, the cover hooked me on book two. I read some negative reviews on Amazon regarding this recipe, and to be fair, looking at the heavy dosage of cardamom got me wondering…is that right? I mean, I agree wholeheartedly with your comments regarding cardamom, pears and white chocolate, but the amount still seems too much. I just hate to waste all those ingredients if it’s going to be something that no one will eat. Have you made your new, tweaked recipe yet? I’d love to know how it turned out. Thanks again; I just found you when I Googled the recipe but I plan to be back soon! Hey thanks for stopping by and leaving a comment – for all the things wrong with this recipe the amount of cardamon is not one of them. 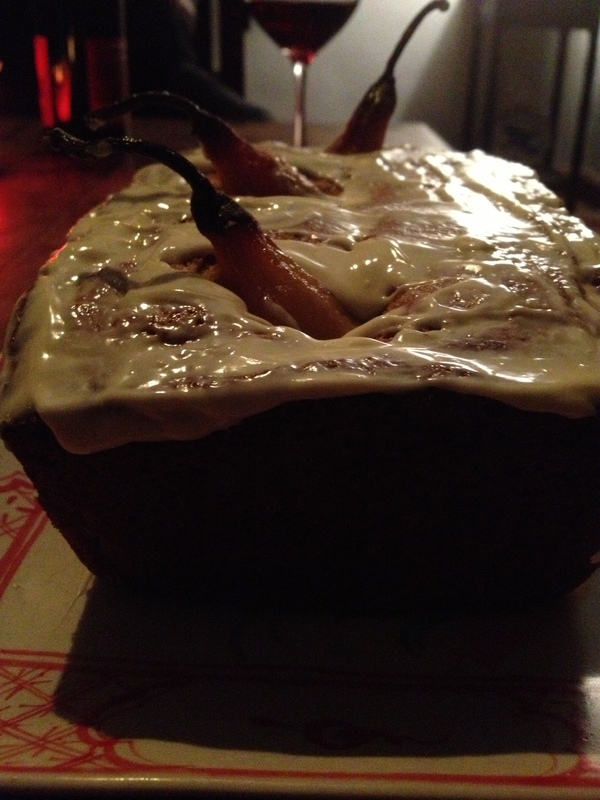 It is surprisingly not overwhelming,mostly this cake is just SWEET with a nice spice touch. I never remade it because the initial process was so frustrating…my big idea would be to not add whole pears but rather chopped them up into chunks and fold them into the batter. I’m not sure they need to be poached. Of course the other thing to try be to make the cake without the pears at all and then sear each slice and a spoon full of poached pears either a half a pear or again chopped up. 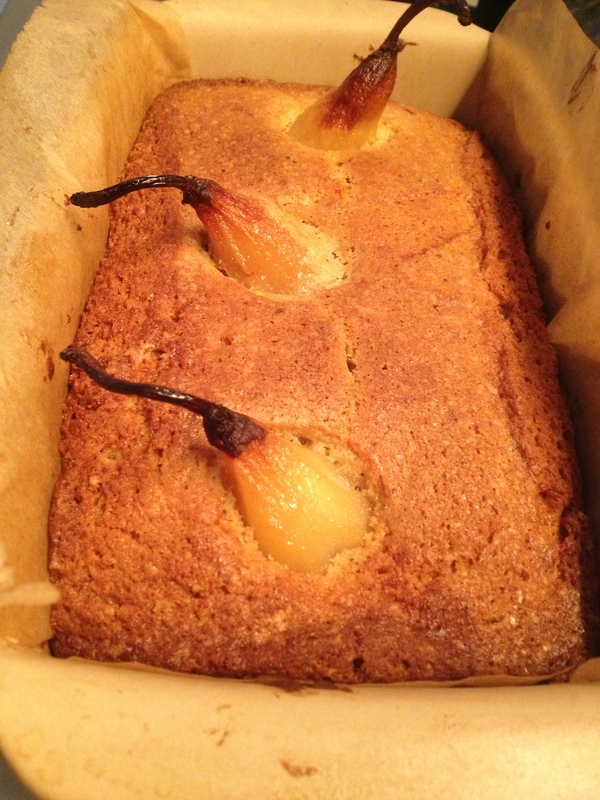 The reason to make this cake it’s outstanding visual but in the end I don’t think it’s worth it – so the question is: Cardamon Loaf cake with Poached Pears is it worth it? Maybe but it was thrilling enough an idea for me to want to try it again. Although writing about it now makes me want a slice! If you served the poached pears halved with a dollop of whipped cream on a slice of cake I think you would have a simple elegant dessert good for the end of a meal or as an accompaniment to tea (like anyone does tea anymore but I grew up with a British grandparent so…). Good luck and if you make it let me know how it turns out. Not sure where you are writing from, but Indian Spice stores have ground cardamon for cheaper than anyone else. I go to Dual on First Avenue here in New York which is in the East Village and you get enough to last a years for around 4 bucks. Thank you for your quick reply, now I’m not afraid of cardamom overdosing. I once had a cumin overdose (about thirty years ago) and I cringe every time I see it listed in a recipe or smell it in food, even now. While I have never loved cumin, I do love cardamom and would hate to have that same reaction to it! I am not sure what I want to do about the pears right now but I am still leaning towards using the whole fruit simply because it is such a stunning look. After all, she made it for the cookbook, so it must be doable! Anyhow, I’m certain from all of the reviews I’ve read that the big problems people are having are because whoever is in charge of swapping the metric measurements to U.S. Standard measurements isn’t quite up to the task. Unfortunately there seems to be a lot of that going around lately. Publishers try to accommodate the growing body of knowledgeable cooks and bakers in the United States who fairly demand metric measurements while the less knowledgeable and less trained cooks and bakers are still screaming for their U. S. Standard measurements. Somewhere along the way, some poor intern gets handed the job and errata is the result (if we are so lucky). Unfortunately it would seem that many publishers aren’t even bothering with publishing the corrections; they appear to want to leave it to the rest of us to figure it out for ourselves. Thank God for Google and fine folks such as you who publish what they’ve figured out for the rest of us! Oops, I almost forgot; I live in a smaller Midwest town (around eighty thousand) but predominately blue collar, so food options, while definitely getting better all the time, are not the best. I found out about The Spice House in Chicago several years ago and I now buy what I can’t find or would prefer to be of higher quality there. (www.thespicehouse.com) They have some magnificent cardamom, among oh-so-many other items. Also, they accidentally made a mistake on my first order and when I contacted them about it, they fixed it immediately, no questions asked. I highly recommend them to anyone looking for spices, recipes and general information regarding spices. I am from Australia and tried baking this cake for the first time. The recipe on the whole I thought was alright but after I baked it, towards the center of the cake fell in too and was gooey like yours. I was wondering what did you do to make it work? I found another website (http://fleurdupoirier.blogspot.com.au/2013/03/pear-cardamom-cake-birnen-kardamom.html) with the same recipe, it look so much more solid than the cover of the book. I use 200g of butter and 4x67g eggs (extra large) and thus wonder if that is the cause of it…particularly the butter which you had so kindly explained. I found that once the butter was adjusted the cake cooked fine – in the end it is not a good recipe, I find the cake too dry and too sweet and the Pears look nice but sitting in the middle of the cake not very practical. 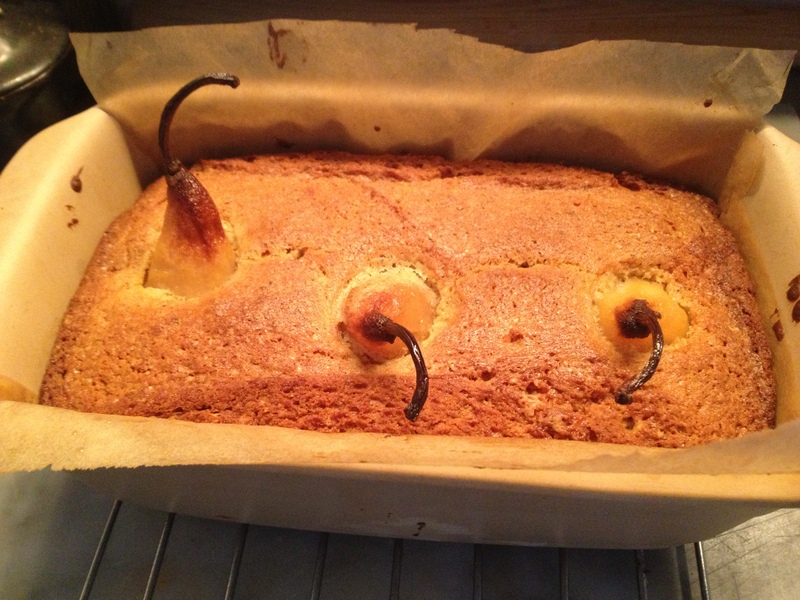 I think to really make this cake successfully you need to chop the pears into bite size chunks and fold it into the batter – thereby making the entire cake moist and incorporating the pear flavor with the cardamon. But if you really want the loaf to turn out like the picture reduce the butter like I previously posted about and cook it longer – a cake tester needs to come out clean from the very center of the loaf – and make sure you have the correct firm pears otherwise as I say they just turn to mush. Good Luck! What about the liquid from poaching the pears? they tell you to reduce it, but never tell you what to use it for? in the picture, it looks like she sliced the bottom of the pair away. However, in the directions, she never mentions to cut it off. This recipe needs HELP! You drizzle it over the sliced cake before serving it.